Cardinaletti, G. Messina, M. Bruno, M. Tulli, F. Poli, B.M. Giorgi, G. Chini-Zittelli, G. Tredici, M. and Tibaldi, E. 2018. Effects of graded levels of a blend of Tisochrysis lutea and Tetraselmis suecica dried biomass on growth and muscle tissue composition of European sea bass ( Dicentrarchus labrax ) fed diets low in fish meal and oil. Aquaculture, Vol. 485, Issue. , p. 173. Brasky, Theodore M. Darke, Amy K. Song, Xiaoling Tangen, Catherine M. Goodman, Phyllis J. Thompson, Ian M. Meyskens, Frank L. Goodman, Gary E. Minasian, Lori M. Parnes, Howard L. Klein, Eric A. and Kristal, Alan R. 2013. Plasma Phospholipid Fatty Acids and Prostate Cancer Risk in the SELECT Trial. JNCI: Journal of the National Cancer Institute, Vol. 105, Issue. 15, p. 1132. 1Gerber, M (2012) Omega-3 fatty acids and cancers: a systematic update of epidemiological studies. Br J Nutr 107, Suppl. 2, S228–S239. 2Crowe, FL, Allen, NE, Appleby, PN, et al. 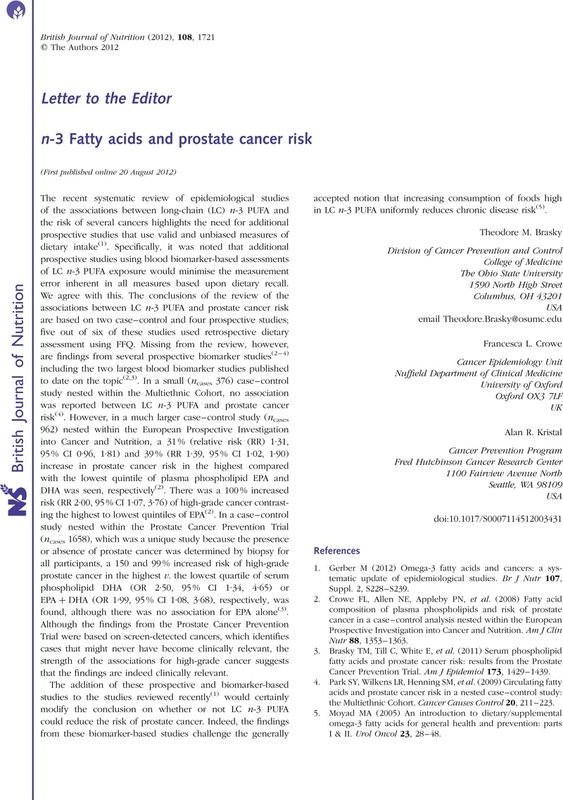 (2008) Fatty acid composition of plasma phospholipids and risk of prostate cancer in a case–control analysis nested within the European Prospective Investigation into Cancer and Nutrition. Am J Clin Nutr 88, 1353–1363. 3Brasky, TM, Till, C, White, E, et al. (2011) Serum phospholipid fatty acids and prostate cancer risk: results from the Prostate Cancer Prevention Trial. Am J Epidemiol 173, 1429–1439. 4Park, SY, Wilkens, LR, Henning, SM, et al. (2009) Circulating fatty acids and prostate cancer risk in a nested case–control study: the Multiethnic Cohort. Cancer Causes Control 20, 211–223. 5Moyad, MA (2005) An introduction to dietary/supplemental omega-3 fatty acids for general health and prevention: parts I & II. Urol Oncol 23, 28–48.